If you are a fan of online slots and looking for something new to play then you are in the right place. New games are being released on an almost daily basis and here we bring you reviews of the best of them. Our chosen three games will take you around the Monopoly board, breaking into safes, and on a journey through the desert to Cairo. Whichever one you choose to play, you will have the chance of winning some huge payouts and thanks to their features, they can all provide you with hours of fun. 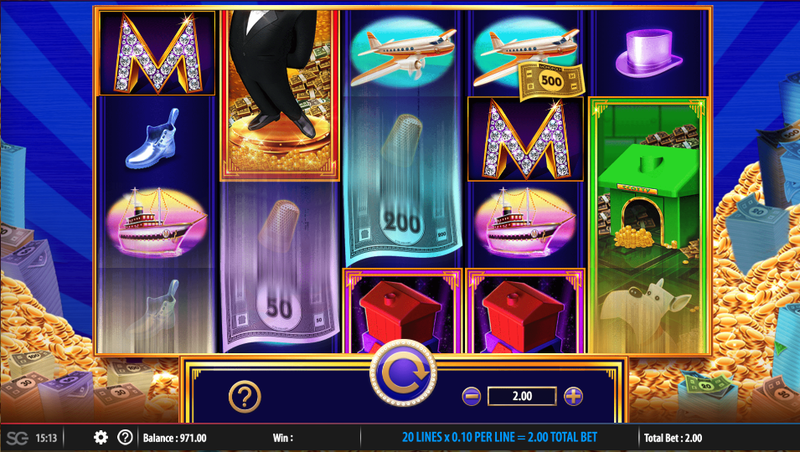 Read on to learn more about these exciting new slots. WMS Gaming has been releasing Monopoly themed slots for quite some time and now they have a new one. It is called Monopoly Big Money Reel and it offers some fantastic bonus features. Monopoly Big Money Reel is a 5 reel slot with 4 rows and 20 fixed paylines. The reels are in a delicate gold frame and behind them you can see piles of cash and gold coins. The three highest value symbols land stacked on the reels and they are Mr. Monopoly, a purple hotel, and a dog and kennel. The other symbols include an aeroplane, a boat, a car, a hat, a wheelbarrow, a boot and a thimble. There is a sparkling ‘M’ wild symbol, it will substitute for all of the other symbols, except for the bonus symbols, to help and form winning combinations. There are numerous bonuses symbols, all of them different banknotes. Five banknotes, worth 20, 50, 100, 200 and 500, can land as overlay symbols on the reels. If this happens then all the banknotes may change into one value or a mixture of the five values. If you land a full screen of banknotes of 20, 50, 100, 200 or 500 you will also win a multiplier payout of 5x, 10x, 15x, 20x or 50x respectively. Utility Bonus– Mr. Monopoly will spin the Wheel of Fortune and collect cash and multiplier values. The round ends when you land on ‘Collect’. Go Free Spins Bonus– This awards eight free spins but before each spin a banknote is chosen (including a special 1000 note) and it will be the only note on the reels for that spin. Any notes that land will award a cash prize. 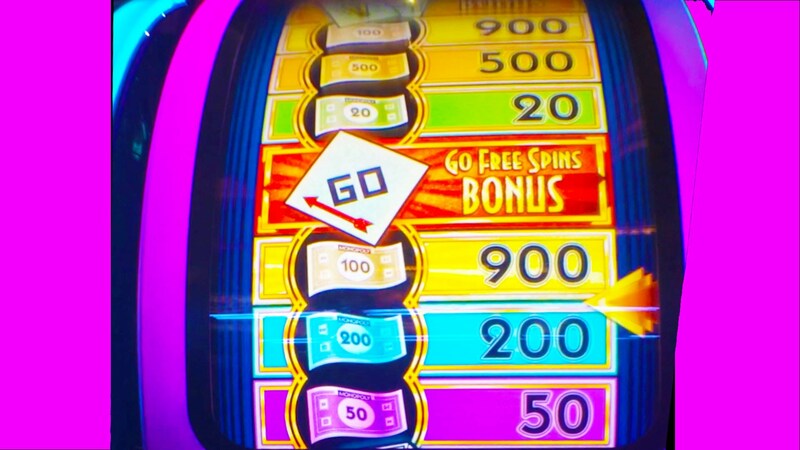 Three, four or five ‘Go Extra Spin’ symbols awards between 3 and 50 extra spins, the number is determined by another fortune wheel. Monopoly Big Money Reel has a betting range of £0.40 up to £200 per spin, so it is not particularly expensive to play. There is a top payout of 150x for landing five Mr. Monopoly symbols along a payline. The hotel can payout up to 125x and the dog and kennel up to 100x. The plane, boat and car can all payout up to 75x, the hat and wheelbarrow can payout up to 50x, and the boot and thimble can payout up to 40x. This feature packed slot can provide you with hours of fun, and gives you the chance of winning some amazing payouts. Give it a spin today and see what Mr. Monopoly has in store for you. If you win really big at your favourite online casino then the chances are you will need to buy a safe in which you can store some of your new valuables and Eyecon Gaming is giving you a glimpse of what this future would be like in its brand new slot Hold the Safe. Hold the Safe is a 5 reel slot with 3 rows and 25 fixed paylines. The reels are against a posh looking purple background and encased in a double gold frame. The high value symbols are all related to the theme and include gold bars, watches, diamonds, rings and a briefcase full of banknotes. The lower value symbols are the playing cards 9, 10, J, Q, K and A. There is a large gold ‘Wild’ symbol that can land on all the reels except for the first. It will substitute for all of the other symbols, except for the two scatter symbols to help and form winning combinations. The scatter symbols are a diamond and a safe. When at least three of the diamond scatter symbols land anywhere on the reels you will win an initial six free spins. Best of all, you can retrigger the free spins a maximum of fifty times, which would be 300 free spins! If you land at least three of the stacked safe scatter symbols anywhere on reels two, there and four, then the safes are locked in place and you win three free spins. During the spins any extra safe symbols that land will also lock in place and reset the number of spins to three. When you run out of spins each safe will open up to reveal a multiplier of up to 500x the total bet. 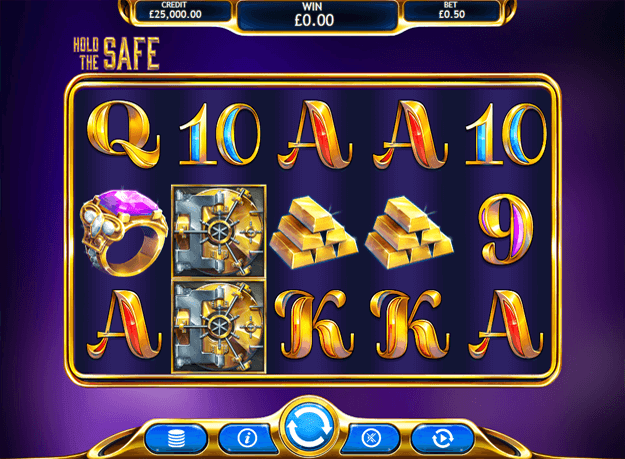 Hold the Safe has a betting range of £0.25 up to £12.50 so it is not very expensive to play. The gold bars offer payouts of up to 200x, and the watches, diamonds, rings and briefcases can all payout up to 150x. A and K can payout up to 75x, while Q, J, 10 and 9 can all payout up to 50x. The scatter symbol also offers huge payouts of up to 50x the total bet. At first this may seem to be a rather simple slot, but you will soon realise that it is hugely enjoyable and the potential returns are massive. Give it a spin today and see what riches you will find when the safe doors open. In the not too distant past, the only way to transport things across the North African deserts was by camel and people would band together and go together on a Caravan to Cairo. Now the journey is brought to the reels in a new slot from Eyecon and it gives you the chance to win some huge payouts. 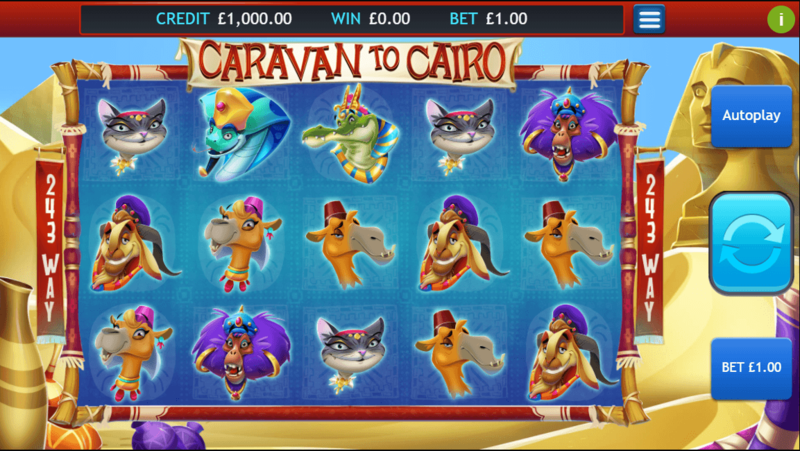 Caravan to Cairo is a 5 reels slot with 3 rows and 243 ways to win. This means that you will win payouts as long as enough matching symbols land from left to right across the reels. The reels are set in a frame made of wooden poles while in the background you can see the desert sands and the distant pyramids. All of the slot’s symbols are related to the theme and they are all animals that are making the journey: a crocodile, a snake, a hippo, a lion, a monkey, a cat, a duck, a beaver, a camel and a camel with a different hat. The pyramid is the wild symbol, it can land on the middle three reels and will substitute for all the other symbols, except for the scatter symbols, to help and form winning combinations. The scatter symbol is an elephant. If you can land three or more of the elephant scatters symbols anywhere on the reels you will get the choice of five different free spins games. You can choose twenty free spins with a 2x multiplier, fifteen free spins with a 3x multiplier, ten free spins with a 4x multiplier, eight free spins with a 5x multiplier and five free spins with a 10x multiplier. Best of all, you can retrigger the free spins up to a maximum of 15 times. Caravan to Cairo has a betting range of £0.25 up to £50 per spin. The crocodile can payout up to 40x the total bet, the snake up to 32x, the hippo and lion can both payout up to 20x, the monkey and cat up to 8x, the duck and beaver up to 5x, and the two camels can payout up to 4x. The scatter symbol also offers payouts of up to 50x the total bet for a spin. This is a fairly simple slot but entertaining nonetheless. It offers the chance of landing some huge wins, and best of all, it is brilliantly optimised for mobile devices so you can play while on the go, even on the way to Cairo. If you are looking for some light hearted fun with the chance of big payouts then set the reels spinning today.